Escape to the great outdoors and meet the local inhabitants amidst a lush of forests, hills and ‘bocage’ countryside. Discover the manor houses, castles, former priories, abbeys, mills and other emblematic Percheron buildings. Enjoy a different kind of excursion… with a horse and a cart, the ideal way to explore the Perche. The Perche, its identity and its way of life are naturally reflected in the local farm produce. 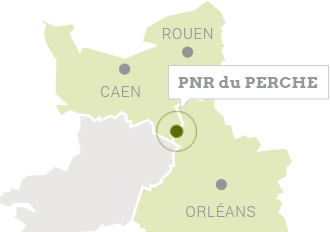 Just 140 km from Paris, the wonderfully pristine setting of the Perche invites you to get away from it all.